How can we take advantage of the opportunities in the nation’s new education law to ensure students excel? DQC’s ESSA Summer Playlist webinar series will take a deeper dive into exploring opportunities in the Every Student Succeeds Act (ESSA) where states can leverage the power of education data. 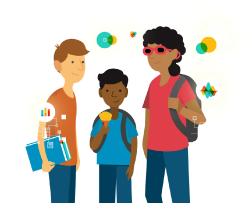 The webinars will cover a range of topics, from using resource data to ensure equity to supporting teachers with opportunities to learn how to use and protect data. Our first webinar is Transparency for Families and Communities. This webinar will discuss opportunities for states to go above-and-beyond mere compliance with ESSA and truly serve their communities by publicly reporting information that is high-quality, timely, and useful. Families and communities are deeply invested in students’ success, and they need information to be empowered partners in a child’s education journey. When all of the adults in their lives are informed—and share a vision for their educational journey—students excel.